Bruce Willis, is an American actor, producer, and musician well known for his film appearances as wise cracking or hard edged characters, often in spectacular action movies. He is well known for roles in movies Die Hard series, Pulp Fiction, The Fifth Element, Armagedon, The Six Sense, Lucky Number Slevin and RED. A Seagrams commercial starring Bruce Wills, where he is singing about wine coolers. There are certain Bruce Willis signatures – the bald head, the self-deprecating humor and the cockiness – and he brings them all to a new campaign for Sobieski vodka. Mr. Willis serves as the brandâ€™s celebrity spokesman, and he owns a small percentage of the Polish vodka makerâ€™s parent company. n a series of â€œBruce Has Ideasâ€ commercials, which began appearing online this week, he makes it clear he has a stake in the company. At the same time, he pokes fun at himself, saying, in one ad, â€œNo, Iâ€™m not just an action hero with rugged good looks and some singing ambitions.â€ In wry exchanges with Sobieskiâ€™s chief executive, Krzysztof Trylinski, Mr. Willis also concedes, humorously, that he is not an expert in distilled spirits, asking in one commercial: â€œWhat the heck does Bruce Willis know about making vodka? Nothing.â€ The ads are part of a digital and print campaign by Sobieski Vodka of North America, which entered the American market three years ago and used a back-to-basics theme to promote its rye-based vodka, the top seller in Poland. 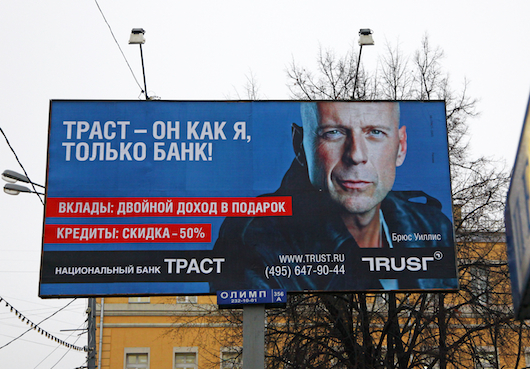 National Bank Trust, one of Russiaâ€™s top 30 banks, has chosen Willis to front a new advertising campaign. Known for his â€˜tough-guyâ€™ persona, the actor has already featured on billboards in Moscow, wearing a leather jacket and a slight, trademark smirk.